Blood group incompatibility between Henry VIII and his wives could have driven the Tudor king's reproductive woes, and a genetic condition related to his suspected blood group could also explain Henry's dramatic mid-life transformation into a physically and mentally-impaired tyrant who executed two of his wives. Research conducted by bioarchaeologist Catrina Banks Whitley while she was a graduate student at SMU (Southern Methodist University) and anthropologist Kyra Kramer shows that the numerous miscarriages suffered by Henry's wives could be explained if the king's blood carried the Kell antigen. A Kell negative woman who has multiple pregnancies with a Kell positive man can produce a healthy, Kell positive child in a first pregnancy; But the antibodies she produces during that first pregnancy will cross the placenta and attack a Kell positive fetus in subsequent pregnancies. 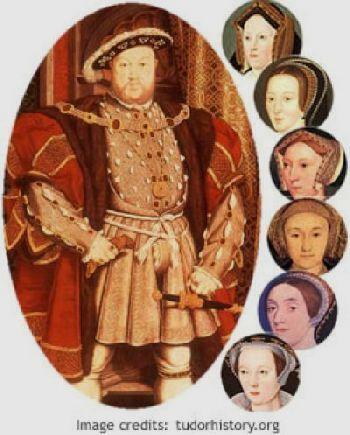 As published in The Historical Journal (Cambridge University Press), the pattern of Kell blood group incompatibility is consistent with the pregnancies of Henry's first two wives, Katherine of Aragon and Anne Boleyn. If Henry also suffered from McLeod syndrome, a genetic disorder specific to the Kell blood group, it would finally provide an explanation for his shift in both physical form and personality from a strong, athletic, generous individual in his first 40 years to the monstrous paranoiac he would become, virtually immobilized by massive weight gain and leg ailments. "It is our assertion that we have identified the causal medical condition underlying Henry's reproductive problems and psychological deterioration," write Whitley and Kramer. Henry married six women, two of whom he famously executed, and broke England's ties with the Catholic Church - all in pursuit of a marital union that would produce a male heir. Historians have long debated theories of illness and injury that might explain the physical deterioration and frightening, tyrannical behavior that he began to display after his 40th birthday. Less attention has been given to the unsuccessful pregnancies of his wives in an age of primitive medical care and poor nutrition and hygiene, and authors Whitley and Kramer argue against the persistent theory that syphilis may have been a factor. A Kell positive father frequently is the cause behind the inability of his partner to bear a healthy infant after the first Kell negative pregnancy, which the authors note is precisely the circumstance experienced with women who had multiple pregnancies by Henry. The majority of individuals within the Kell blood group are Kell negative, so it is the rare Kell positive father that creates reproductive problems. Further supporting the Kell theory, descriptions of Henry in mid-to-late life indicate he suffered many of the physical and cognitive symptoms associated with McLeod syndrome - a medical condition that can occur in members of the Kell positive blood group. By middle age, the King suffered from chronic leg ulcers, fueling longstanding historical speculation that he suffered from type II diabetes. The ulcers also could have been caused by osteomyelitis, a chronic bone infection that would have made walking extremely painful. In the last years of his life, Henry's mobility had deteriorated to the point that he was carried about in a chair with poles. That immobility is consistent with a known McLeod syndrome case in which a patient began to notice weakness in his right leg when he was 37, and atrophy in both his legs by age 47, the report notes. Whitley and Kramer argue that the Tudor king could have been suffering from medical conditions such as these in combination with McLeod syndrome, aggravated by his obesity. Records do not indicate whether Henry displayed other physical signs of McLeod syndrome, such as sustained muscle contractions (tics, cramps or spasms) or an abnormal increase in muscle activity such as twitching or hyperactivity. But the dramatic changes in his personality provide stronger evidence that Henry had McLeod syndrome, the authors point out: His mental and emotional instability increased in the dozen years before death to an extent that some have labeled his behavior psychotic. McLeod syndrome resembles Huntington's disease, which affects muscle coordination and causes cognitive disorder. McLeod symptoms usually begin to develop when an individual is between 30 and 40 years old, often resulting in damage to the heart muscle, muscular disease, psychiatric abnormality and motor nerve damage. Henry VIII experienced most, if not all, of these symptoms, the authors found. Henry was nearly 18 when he married 23-year-old Catherine of Aragon. Their first daughter, a girl, was stillborn. Their second child, a boy, lived only 52 days. Four other confirmed pregnancies followed during the marriage but three of the offspring were either stillborn or died shortly after birth. Their only surviving child was Mary, who would eventually be crowned the fourth Monarch in the Tudor dynasty. The precise number of miscarriages endured by Henry's reproductive partners is difficult to determine, especially when various mistresses are factored in, but the king's partners had a total of at least 11 and possibly 13 or more pregnancies. Only four of the eleven known pregnancies survived infancy. Whitley and Kramer call the high rate of spontaneous late-term abortion, stillbirth, or rapid neonatal death suffered by Henry's first two queens "an atypical reproductive pattern" because, even in an age of high child mortality, most women carried their pregnancies to term, and their infants usually lived long enough to be christened. The authors explain that if a Kell positive father impregnates a Kell negative mother, each pregnancy has a 50-50 chance of being Kell positive. The first pregnancy typically carries to term and produces a healthy infant, even if the infant is Kell positive and the mother is Kell negative. But the mother's subsequent Kell positive pregnancies are at risk because the mother's antibodies will attack the Kell positive fetus as a foreign body. Any baby that is Kell negative will not be attacked by the mother's antibodies and will carry to term if otherwise healthy. "Although the fact that Henry and Katherine of Aragon's firstborn did not survive is somewhat atypical, it is possible that some cases of Kell sensitization affect even the first pregnancy," the report notes. The survival of Mary, the fifth pregnancy for Katherine of Aragon, fits the Kell scenario if Mary inherited the recessive Kell gene from Henry, resulting in a healthy infant. Anne Boleyn's pregnancies were a textbook example of Kell alloimmunization with a healthy first child and subsequent late-term miscarriages. Jane Seymour had only one child before her death, but that healthy firstborn also is consistent with a Kell positive father. Several of Henry's male maternal relatives followed the Kell positive reproductive pattern. "We have traced the possible transmission of the Kell positive gene from Jacquetta of Luxembourg, the king's maternal great-grandmother," the report explains. "The pattern of reproductive failure among Jacquetta's male descendants, while the females were generally reproductively successful, suggests the genetic presence of the Kell phenotype within the family.